Williamson Lane: Sew Much Lately?!? I think I've mentioned here and there that I've been busy sewing for the kids. I guess I haven't fully explained that, mostly because I've been so busy. Pretty much any time Karis is down for her nap or when she goes to bed at night for the past two weeks I'm stitching something...or cutting, prepping, ironing, designing, checking and rechecking my lists, etc. You may be wondering why so much, right now. Well, a week from today we are heading to Asheville for the weekend. We have to go visit our storage unit and pick up some of our baby items; car seat, swing, play mat, boppy, etc. When we do this we will also be taking back my embroidery machine. I will not have use of my machine again until we are settled somewhere. This could technically be a year from now, but probably more like 9 months. That's a long time. On top of that, I live under no grand illusions that I will have all this free time on my hands to sew things for my children. After all, I will be just as busy as I am right now keeping up with my very busy and active, 21 month old...PLUS nursing a new baby every 3 hours, changing an extra 10 diapers a day, doubling my laundry load, etc. Yes, life is going to be interesting, but I can hardly wait. If you know me, you know that I am a planner. I love it. I get a vision, I make a plan, I execute it. This is how I love to operate. Well, with the circumstances of our life right now, this is totally unfeasible. We are currently living under such conditions that at any given time we could be told we are moving (except, of course, for the next couple of months), so we must pack up and move. It's our nomadic, unsettled, albeit temporary life. Because of this I don't get to plan hardly anything at all. It's actually been a little difficult for me during this pregnancy. When I was pregnant with Karis I got a vision and designed, down to the smallest detail, every bit of her nursery. I scoured through fabrics until I found exactly what I wanted. I tediously painted every piece of artwork for her room. I had a vision and it came to life. Well, Jack doesn't get a nursery. He gets a pack n' play in the corner of our bedroom. I realize that's actually what a lot of people do when they have a baby regardless, but we like our babies to learn to sleep in their own rooms early on. Kinda hard when baby doesn't have a room. :) So, no nursery to plan. But, I did get to plan my children's wardrobes (at least what is homemade or home-stitched) for the next 9 months. This is actually a pretty difficult task. When it's 90 degrees out it's hard to decide what I want my kids to wear at Christmas time. However, decisions were made, designs were created, and clothes were stitched. 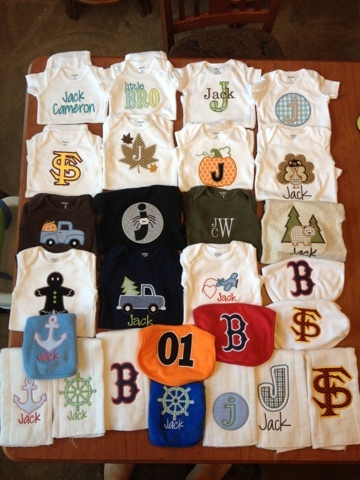 Jack doesn't have any homemade clothes, but he did get lots of things appliqued. I know, Karis got hardly anything, but she got so much other stuff that I cannot offer Jack. So, here's a glimpse at Jack's lot. I am technically done with his stuff, although I'd like to do a few more burp cloths and bibs. At some point I will take better pictures and give you a better look at my work, but for the most part you will have to wait until the model himself is here to display these things. I covered all the seasons and holidays that we will go through in the next several months...Fall, Halloween, Thanksgiving, Christmas, Valentine's Day. His littlest onesies are mostly just his name, intials, etc. not theme-y. He's got baseball (Red Sox) and football (FSU) covered, plus a few more fun things thrown in there. Now you may be thinking this is a lot, but look at it from my point of view. As I mentioned before, I won't have a machine for a long time. But, right now, I have the ability and resources to make him cute homemade things, so why not take advantage?!? Also, there are no showers for Jack, no hand-me-downs...none of the things that really helped us along with Karis. It's totally up to us to provide all he needs, which includes all his clothes, burp cloths and bibs. So, really, it's actually quite necessary for me to do this.